Generally, bees are much friendlier and won’t use their stinger unless they are in real threat. Mainly, it’s because their stinger detaches from their bodies and they die within minutes due to the abdominal rapture. 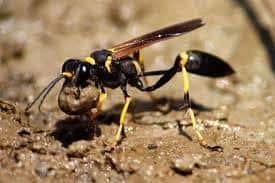 Now, wasps are much more aggressive and dangerous since their stinger remains attached to their bodies at all times, they can use it more than once when agitated. Let’s just say they will fight you and won’t give up easily. Summary: Africanized honey bees nest in a variety of areas (garages, sheds, old tires, lumber piles etc.). 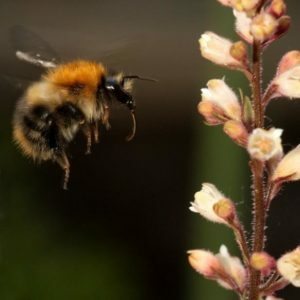 They are considered to be the most aggressive type of bees you can meet in the Las Vegas area, as they will vigorously defend their hives when threatened. The best cure to get rid of honey bees nest is to seek professional help upon noticing a hive. Any movement around the hive can trigger an attack as they are extremely sensitive and won’t distinguish people from any other animal threat. Summary: Bumblebees are your friendly neighborhood flyers. They are extremely sociable, and although only females could sting they will rarely do so. They feed on nectar, slowly floating mid-air from flower to flower. These bees are a crucial part of any ecosystem and should only be killed or reallocated if there’s a serious threat of an allergic reaction. The best course of action is to call a professional who can reallocate the hive to a safer environment. Summary: European hornets tend to make their hives out of sight, high up in trees or shrubs. This makes the nest hard to spot and reach. By the time the nest is discovered, it’s usually the size of a basketball. 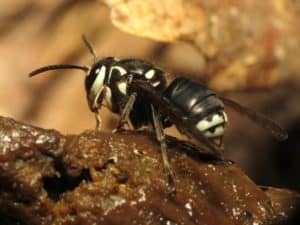 They aren’t overly aggressive but will become if the nest is disturbed or if they are guarding food sources – that’s why hornets can be seen flying around composts or garbage cans, as they have a preference for produce leftovers. 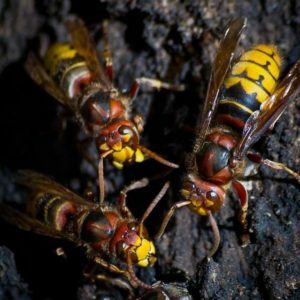 If you stumble upon European hornet, this usually means the nest is close by as they seldom roam far away from it. Summary: Like the European hornets, bald-faced hornets tend to construct their hives way up in the trees or shrubs, especially rhododendron shrubs. Hives are oval and papery and can be as large as a basketball when discovered. They are much more easily irritated and can sting multiple times. The poison in their stingers is highly potent and can be very dangerous and harmful. Much like European hornets, black jackets can easily be spotted flying around garbage cans compost areas. Summary: Carpenter bees will cause concern due to their similarity to bumblebees but are entirely harmless. Only female carpenters possess stingers but will use them only if provoked. 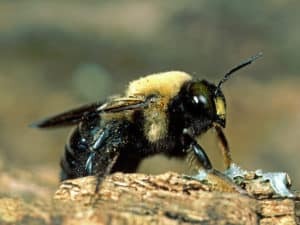 Carpenter bees don’t build hives, but rather dig tunnel-like structures in wood in which they spend their solitary lives. During winter, they hibernate. They will abandon their homes in spring to mate. Male bees die after mating, and females prefer to return to the exact same tunnels to lay eggs. This is basically the only threat the carpenter bees pose. As they will return year after year digging even deeper holes in porches and wooden structures, they can create quite a damage. The best way to repel carpenter bees is to regularly varnish outdoor wooden surfaces, which will be harder for bees to dig. Summary: Their name isn’t a coincidence, as mud daubers are famous for their hives which look like pipe organs built in the mud. 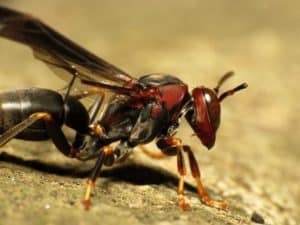 These wasps aren’t aggressive and will only attack if their hives are stepped on. They prefer to feed on nectar, but are also carnivorous and prefer to eat spiders. They will sting spiders in order to paralyze their bodies. Wasps will then drag bodies into their holes, stacking and storing the prey for the feast. They will rarely sting humans, but it’s better to be cautious as their stings are painful and can pose a threat to an allergic person. It’s best to check outdoor areas regularly making sure there aren’t any cylindrical shapes dug in muddy areas. Summary: Paper wasps are slender-waisted, long-legged species of wasps that are entirely docile. They are beneficial to any gardener as they control and eat other fruit-eating flies and insects. They prefer to build their nests in trees and shrubs and are unique by their umbrella-like appearance. Although they are considered to be beneficial, as they are great pollinators and will control and eat other insects, they can still be unwanted in urban areas, building their nests on doorways and other high-traffic areas. Although they will seldom harm humans, they can still do so if agitated and provoked and any person that’s allergic can experience serious problems. Summary: Although small, yellow jackets are fierce attackers you don’t want to be facing, as they will aggressively defend their nests and any other food sources they’ve claimed for themselves. Only females survive the winter, after which they start to lay first eggs and expansion of the colony begins. Like any other wasp species, yellow jackets are great pollinators but pose a serious threat to humans as they are overly aggressive. 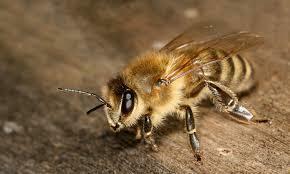 Their sting is extremely unpleasant and painful, especially to allergic people. They can also nest inside walls and other structures so it’s best to consult a professional who can assess the situation properly. Implement standard measures of precaution and be alert. 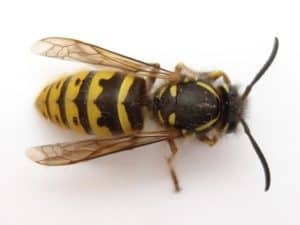 If you spot or suspect an infestation of any type of bees or wasps, messing with them or leaving the situation uncontrolled can turn out to be a risky gamble, especially if you know someone who’s allergic. Stay alert and call Las Vegas Pest Control today at 702 369 BUGS and get protected for as little as .27 cents a day.